Gerald McCoy says he's approaching his ninth training camp with the Tampa Bay Buccaneers the same way he has all the others. 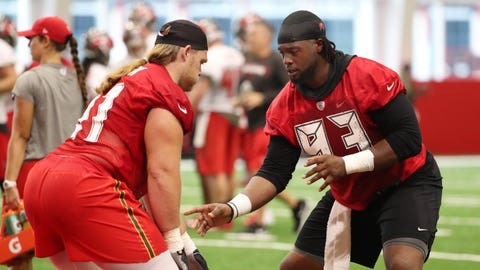 TAMPA, Fla. (AP) — Gerald McCoy says he’s approaching his ninth training camp with the Tampa Bay Buccaneers the same way he has all the others. The six-time Pro Bowl selection really doesn’t feel there’s any reason to change because attitude is a big part of his success. “I always try and stay in the rookie mindset, always willing to learn more, knowing I can learn more, and just do my best to learn more,” the 29-year-old defensive tackle said. It’s not the first time a player of his stature has claimed the same thing, but there’s no disputing the 6-foot-4, 300-pound McCoy’s desire to get better and help the Bucs re-emerge as contenders. Tampa Bay has missed the playoffs the past 10 seasons, the second-longest drought in the NFL behind the Cleveland Browns, who haven’t earned a playoff berth since 2002. McCoy, who has 48½ career sacks and has been selected to play in six consecutive Pro Bowls, was the third overall pick in the 2010 draft. Personal success, however, has been bittersweet. A year ago, Tampa Bay’s defense ranked at or near the bottom of league rankings in several key categories, including passing, total yards and points allowed, as well as sacks and third-down efficiency. General manager Jason Licht and coach Dirk Koetter are counting on the trend changing after upgrading around McCoy with the offseason acquisition of veteran defensive linemen Jason Pierre-Paul, Beau Allen, Vinny Curry and Mitch Unrein, as well as first-round draft pick Vita Vea. Pierre-Paul had 58½ sacks over the past eight seasons with the New York Giants. Allen and Curry were productive members of a deep defensive line rotation that helped the Philadelphia Eagles win the Super Bowl last winter, while Unrein was part of Denver’s AFC championship team five years ago. Vea was the 12th pick of the draft. “We brought in four new guys that have all played in a Super Bowl, and three of them have won it. That’s a lot of experience. Guys who know what to do and how to do it — do it the right way,” the ninth-year pro said. Curry, who started every game for the Eagles last season, said the linemen are building chemistry and learning more and more about each other every day in practice. “My biggest thing is I’m telling everyone: winning is contagious,” Curry said. McCoy is doing his part, too. In addition to picking the brains of the veteran newcomers, he has been spending extra time after practice helping some of the younger players trying to earn jobs. McCoy recalls the early years of his career, when there weren’t any experienced defensive linemen on the team to take him under their wings.